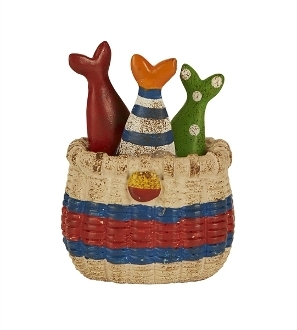 Fishing Creel Basket for Miniature Gypsy Fairy Gardens. Full Description: This mini fishing creel is the perfect place for the day's catch! Featuring all weather-paint and hand-painted details, it is a must-have for any lake or coastal mini garden. Designed by Genevieve Gail.